American Furniture Alliance (AFA) is a budget-priced bean bag refill pack that comes highly recommended from its customers. 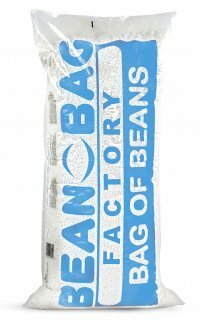 These virgin polystyrene beans will restore your deflated bean bag to its former glory in no time. Each bean is about 1 cm in size. Almost like a large pea and is thick and fluffy. It’s not like an air filled bean that gets deflated within weeks. As a result, this holds on very well to regular use. Some customers quipped at length on how it did not ‘squish’ or sink even when used by a 250 lbs. adult man. That’s the only testimony that it needs. Each pack contains 100 liters of refill beans. To give you a rough idea, that bag can suffice for 1 Big Joe bean bag that’s about 25-50% flattened. If you are looking to rejuvenate a completely flattened bean bag, or prefer a bean bag that’s densely packed with beans, then you might need to buy two refill packs instead. Thankfully, it’s not too expensive. The AFA bean bag refill comes in a secure, child-proof bag that ensures that curious toddlers can’t find their way into bean bag refills. The advertising for the AFA bean bag refill is underscored by claims of an exclusive design by Disney. We found that a little gimmicky as that does not improve on the quality of the product in any way. With the quality of the beans and a very attractive price tag, you’d be hard pressed to find a better bean bag refill than this one.